Each player has two pawns and can move either one on a turn. This is a fairly simple decision, but it offers children a sense of ownership over the game and their choices. There is valuable treasure in these parts. The map says it plainly enough. As long as we can stay afloat on these multicolored waves, I think we can reach our payday. But why is the sea so turbulent here? And why are our coracles being dashed against the rocks? These waters belong to Titus Tentacle. Can you sneak past him to seize the treasure? Titus Tentacle is a children’s game for two to four players. Each player moves around the board trying to avoid Titus and collect coins. The first player to earn three coins wins. Titus Tentacle set up for four players. The game box is part of the board. 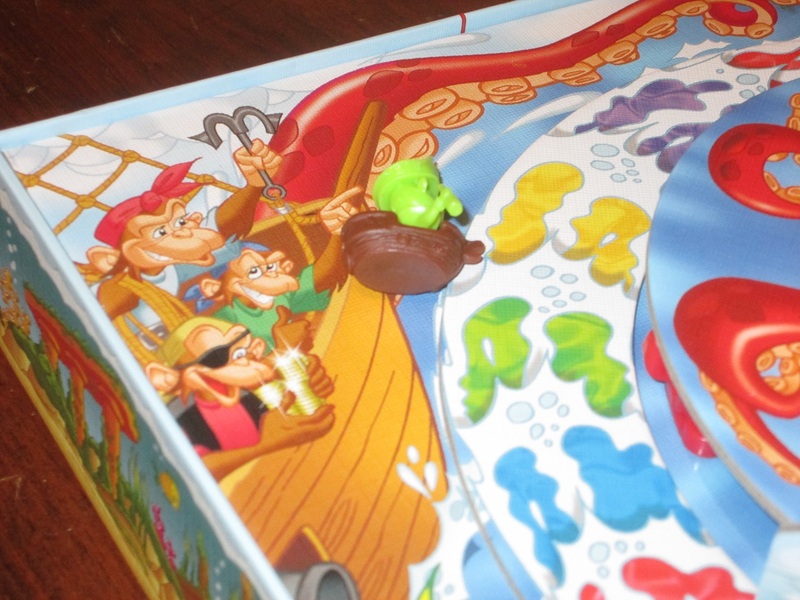 Each player places two pirate monkey pawns of their color on the start space. 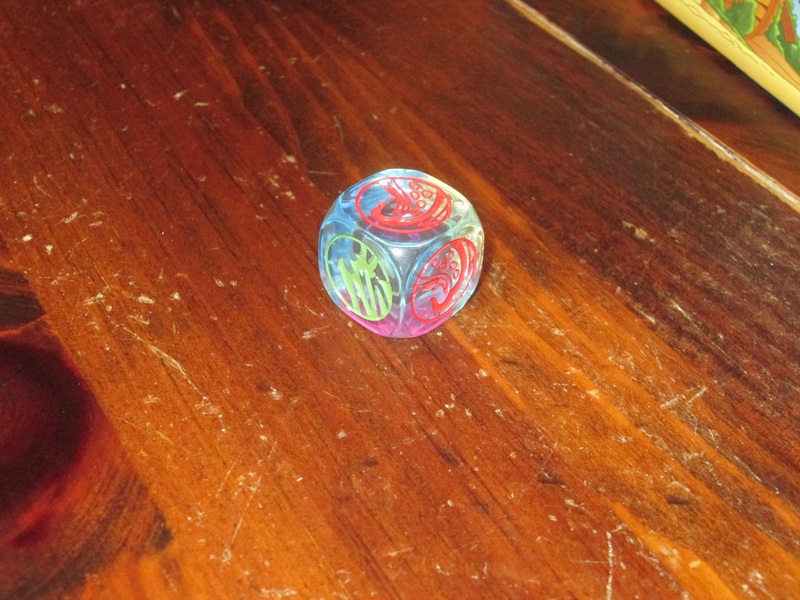 On a turn, players will roll the die and move one of their pirates to the next unoccupied space of that color. 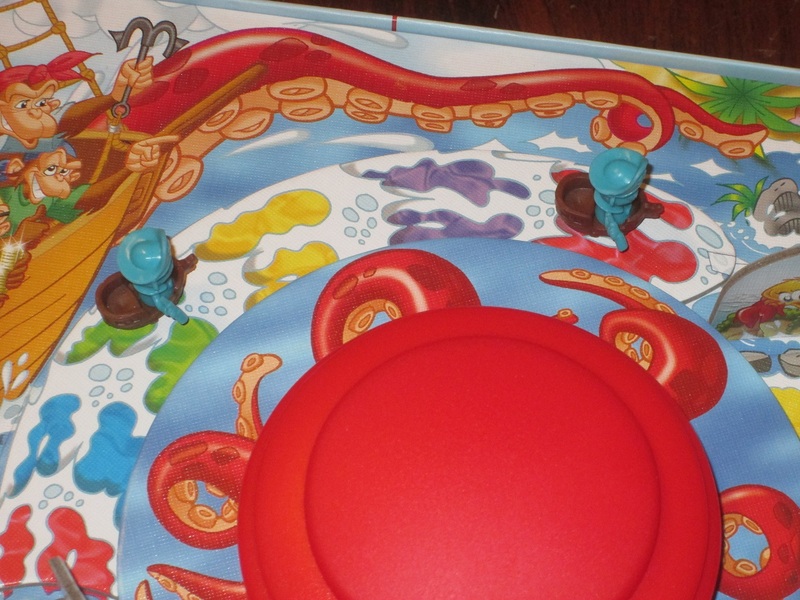 If the die shows red, the player will also position Titus and press down on his head, sending out tentacles to potentially knock other players off the board. Players collect coins by making a full trip around the board, and once one player earns three coins, that player wins. Titus Tentacle is a children’s game, to begin with. And it’s not a children’s game like some others from HABA’s line (Dancing Eggs, Animal Upon Animal, Rhino Hero, etc.) that you will be likely to pull out if only adults are at the table. But for kids, Titus Tentacle seems like a great fit. The kraken arms are a little too swift for me to capture in motion, but here you can see how the Titus Tentacle feature works. Players press hard on the bellows, and kraken arms shoot out the bottom. 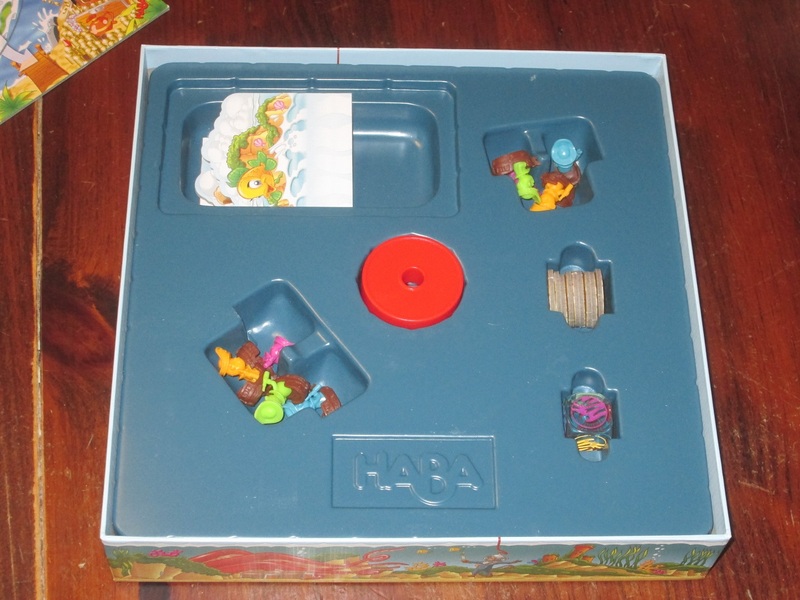 First, the production for the game is up to HABA’s usual standards. 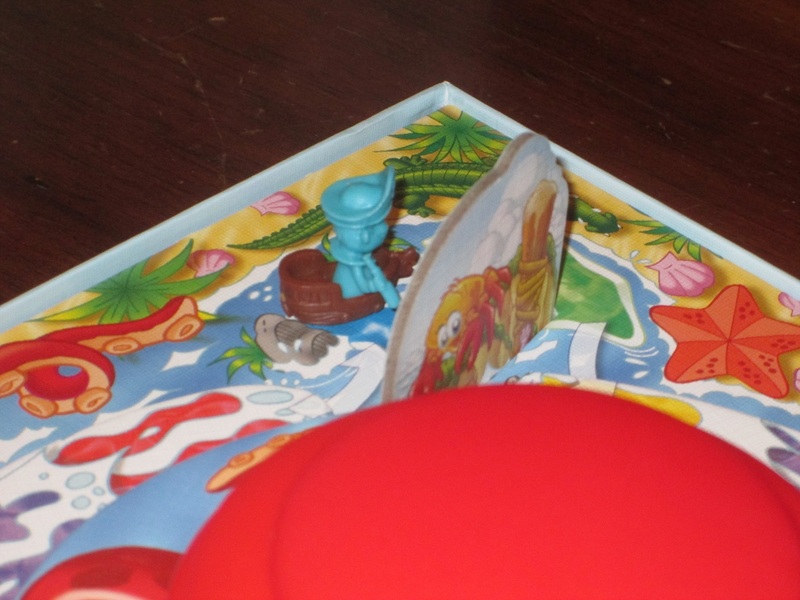 The game board and pieces are colorful, and the entire game directs the eyes to the titular Titus, who takes center stage, as he should in a game that’s half toy like this. Indeed, when I set the game up on my table, my kids were instantly curious about what this is, and even my two-year-old insisted on playing. The game box is very deep, but much of this is to accommodate the insert, which doubles as the game board. While it’s a large amount of real estate for my crowded shelves, it’s probably not too large if you either don’t have many children’s games or have a dedicated game area in your home. 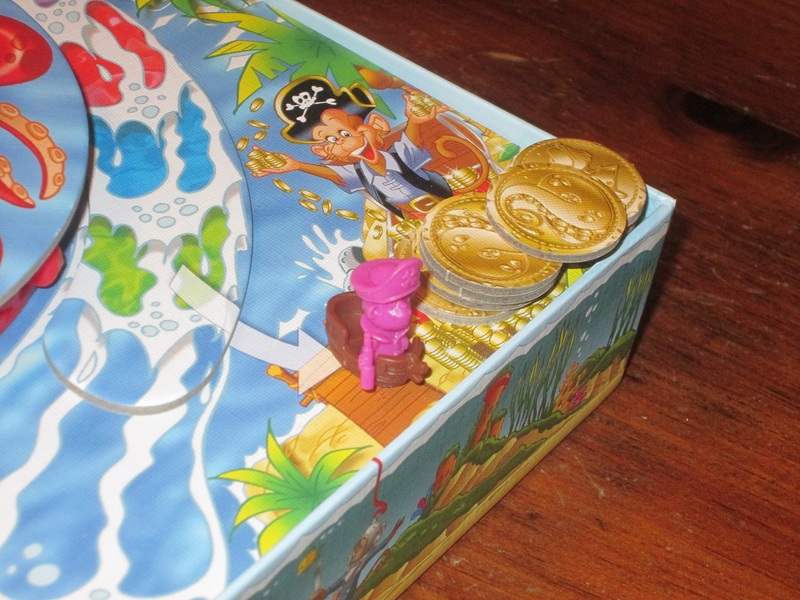 Monkeys are at start, just itching to get the treasure (or be thrown off course by Titus’s whims). Children’s games are tough to get right. They should involve some form of agency so children can get used to making decisions, but they should not involve so many choices that children are overwhelmed with what they can do. Titus Tentacle strikes the perfect balance for the audience here, even more than some games because there is a lot that can be customized. It’s so easy to be blown off course. My four-year-old son doesn’t have much of an attention span for games yet. It’s hard to get him to attend long enough to invest in what we’re doing, and so some of the finer points of decision-making are lost on him. In our first game of Titus Tentacle, we worked on taking turns (and especially letting his sister take hers) and on identifying what the next unoccupied color was around the circle. Again, the colors are vibrant and attractive, the turns are short, and there’s enough of interest that, even though he wasn’t making tons of choices, he was engaged in what we were doing. The main reason for his engagement was Titus Tentacle himself. 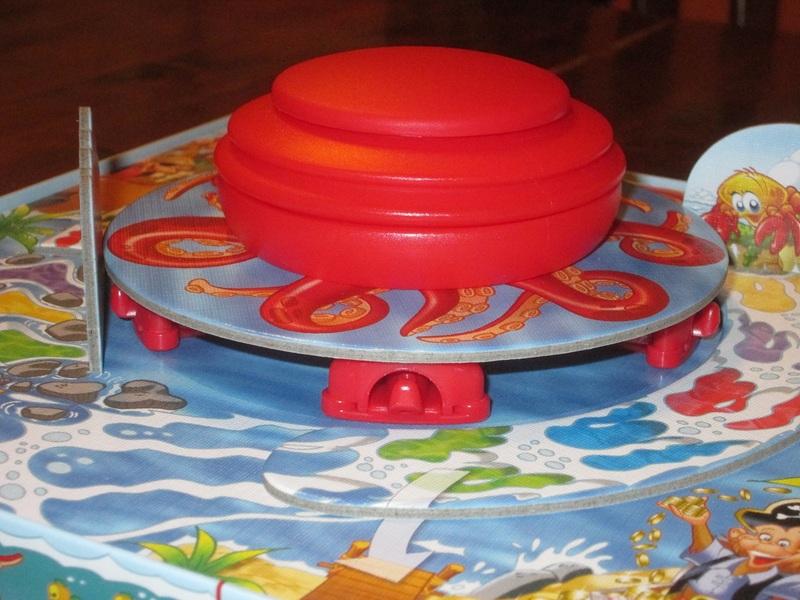 Both kids loved it whenever they rolled red and got to push the bellows to send out the kraken arms. Granted, they didn’t strategically position him first, and sometimes they blew their own monkeys off their spots, but they didn’t care: they thought it was great to set Titus loose on the board. The die in Titus Tentacle. Two sides show red, so it shows up more often than the other colors. Which is great, because this is really what kids (at least mine) want. There are two wall pieces that allow for two “lees,” where players are safe from Titus’s tentacles. I said that Titus Tentacle is easy to scale up depending on where your kids are, and I mean that. While any children (even my two-year-old) can enjoy seeing Titus knock players’ pieces around the board, the game can be played more competitively. The goal is to efficiently collect coins, and as kids get older, the decision of which player piece to move becomes more important. Similarly, there are further considerations like the two “lee” pieces, which offer a safe harbor from prying tentacles (so choosing safety is sometimes better than moving farther), and players can position Titus to where they think he will do the most harm to the other players. No, this isn’t Puerto Rico, but it’s also not Candy Land. There are real decisions for children to make when they are old enough to make them, yet the game is simple enough for even younger kids to play with some direction. Titus Tentacle is a huge win in this regard. Riches. it’s what it’s all about. The box says that the game plays in 10-15 minutes, and this is probably accurate, depending on who is at the table. The box also offers suggested ages of 4-99. Again, I wouldn’t play this game with only adults, but Titus Tentacle is a very good way to engage budding hobbyists in board gaming. Both of my kids–just turned two and just turned four–weren’t quite ready for the game rules as written (or, in the case of my four-year-old, the attention demanded of him), but as I said, I suspect they will grow into the finer points of the game as they get older. The included rules are in several languages, but the rules in each language are only one illustrated leaf, front and back, and are very easy to digest. 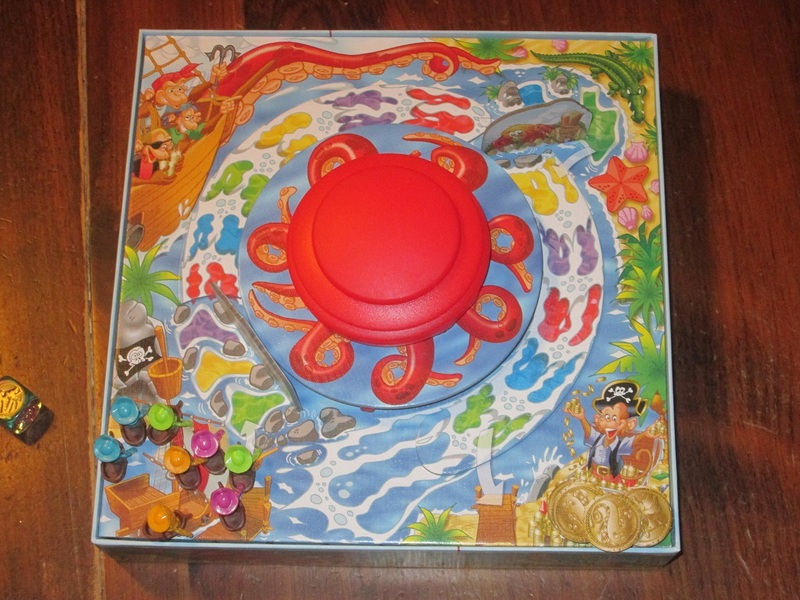 The insert for Titus Tentacle holds everything, including Titus and the game board. Titus Tentacle is a fun game with a unique hook in a charming package. It’s not a game I’ll seek out at game night, but it is a game I will eagerly play with my kids anytime they request it. 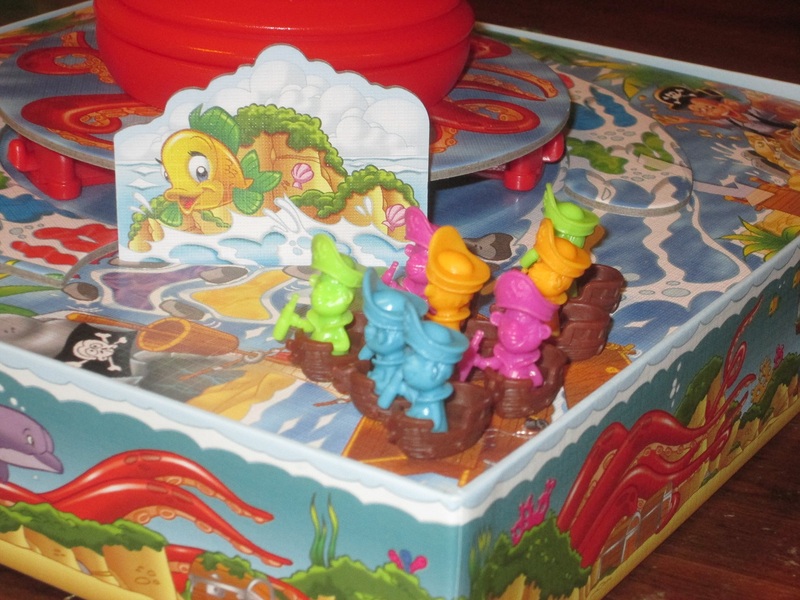 It’s such a joy to see their excitement at sending out fishy fingers to deal destruction (even to themselves), and it’s fun to play a children’s game that helps them learn basic gaming concepts like taking turns and moving to the “next unoccupied,” even if they aren’t ready for everything the game has to offer. But, as they continue to request the game and grow in skill, I suspect the game will become even more fun to play. 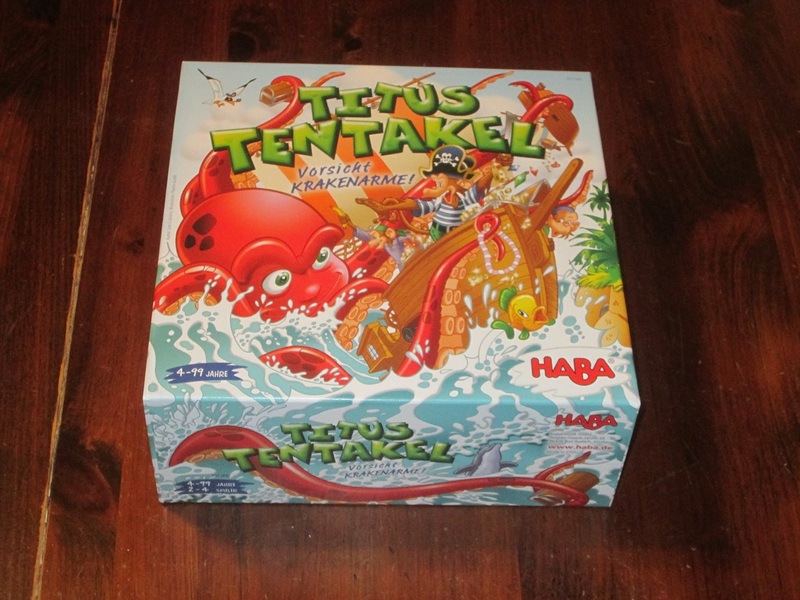 iSlaytheDragon would like to thank HABA USA for providing us with a copy of Titus Tentacle for review.